Floor heating mats are designed for your convenience. They offer a quick and easy installation of a low-profile, energy-efficient heating solution. Heating Mats are composed of durable heating cables ready-attached onto a mat backing, allowing for a quick and convenient installation of a floor heating system. 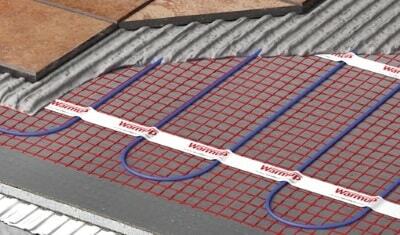 Warmup’s range of Heating Mats include the StickyMat System and the Foil Heater. Both systems feature thin, dual-core heating elements and a low-profile design, meaning they will have little-to-no impact on floor build-up heights. Suitable for all projects and floor types. Which Heating Mat is Best for me? The perfect floor Heating Mat for your project is dependent on a few variables such as the floor finish used and the size and heat loss of the room in which the system is being installed. The StickyMat electric floor heating mat system features a 1.8mm heating wire and a self-adhesive backing for a rapid, hassle-free installation. It can be used with a wide range of floor finishes and subfloor types and is available in two different power variants. The Foil Heater is an electric underfloor heating mat that utilises an aluminium foil matting to encompass the heating wires and gently diffuse the heat evenly into the room. It is most suitable for use with floating floor finishes. Warmup’s range of Heating Mats make heating your home intuitive and easy, no matter your floor type. The StickyMat System can be used with a wide array of floor finishes including wood, vinyl, tiles or carpeting but floor coverings should not exceed 1.5 tog. Always check with your flooring supplier that your selected floor finish is compatible with underfloor heating. The Foil Heater has been specifically designed to be installed with floating floor finishes such as laminate and engineered wood. If you are using the Foil Heater with as softer floor covering like carpeting, the heater must be installed alongside the Dual Overlay System; this acts as a stable subfloor on which the floor finish is installed, protecting the heater from excessive load-bearing weight. The StickyMat and Foil Heater are available in a range of clear, convenient sizes. The width of both Heating Mats is 500mm and they can be ordered in runs to heat areas from 1m2 to 12m2 (StickyMat is available to heat areas up to 15m2). Heating mats can be used as either a primary or secondary heat source. The StickyMat is also available in two different power variants; 150W/m2 and 200W/m2 – using a higher power variant improves heat-up times in spaces of high heat loss. It is recommended to always use Warmup Insulation Boards with an electric floor heater and to carry out a heat-loss calculation to work out the precise heating requirements for your project. Both the Foil Heater and StickyMat electric floor heating mats offer a low-profile heating solution which will have little-to-no impact on floor build-up heights. Both Heating Mats feature an ultra-thin heating wire and a system depth of just 3mm. The StickyMat can be installed within a layer of tile adhesive or levelling compound, making it a truly ‘invisible’ floor heater whilst the Foil Heater must be installed with our Insulated Underlay and in some cases the Dual Overlay System as well, thereby providing a slightly thicker floor build-up. Underfloor Heating Mats are ideal for regular shaped rooms, if you are installing floor heating in a more irregularly shaped area, one of our Heating Cable Systems may be more suitable. Electric Heating Mats provide rapid installation times, allowing you to enjoy the benefits of underfloor heating quickly and hassle-free. The Foil Heater offers a ‘dry’ installation, with no adhesive or levelling compound needed. It can be simply rolled out onto the appropriately insulated subfloor in parallel runs before being covered with the final floor finish. The StickyMat System features a pressure sensitive self-adhesive backing that binds the mat to the subfloor. The system is then typically covered in a thin layer of tile adhesive or levelling compound before the floor covering is installed.